CoSynth shows at this year's embedded world several systems for industrial image processing and intelligent controllers for Industrial Internet of Things (IIoT). Visit us at Hall 4, Stand 4-102. In 2018 embedded world opens from 27.02.-01.03. in Nürnberg. Please contact us for tickets and appointments. CoSynth shows at this year's embedded world several systems for industrial image processing and intelligent controllers for Industrial Internet of Things (IIoT). Visit us at Hall 4, Stand 4-601. In 2017 embedded world opens from march 15.-17. in Nürnberg. Please contact us for tickets and appointments. CoSynth will showcase its new OpenCL interface to ZYNQ FPGA systems.Visit us at Hall 4, booth 4-532. the embedded world exhibition will take place from 24th-26th of February in Nuremberg. 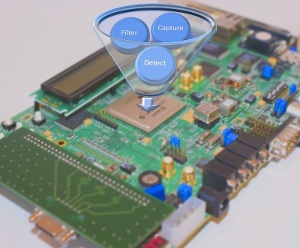 CoSynth is offering ready-made components for hardware accelerated industrial image processing. These IP cores are optimized for use in FPGAs. Fast and compact embedded systems are quickly developed with their help. Typical application areas are machine vision, industrial automation and similar areas of industrial image processing. The component interfaces are using standardized connections for easy and efficient combination of multiple modules for complex processing. The parallel execution of the components on the FPGA yields high frame rates even for huge image resolutions. All typical image processing functions, such as convolution, morphological operators, scaling, contrast and color adaption are available. Bayer pattern demosaicing and color space conversions are supported by the preprocessing modules. Further modules provide edge enhancement, image segmentation, integral image calculation and other statistics on a per-image base. These allow for implementing more complex processing chains, e.g. for object recognition. For use with camera based systems, IP cores for the integration of cameras via LVDS and Ethernet are available. Other IO modules support various bus protocols for the integration of the image processing module into the complete system. This enables a rapid prototyping of a system on chip in combination with a micro controller or processor. The IP core pool is continuously being extended. CoSynth also offers IP cores beyond image processing, e.g. for communication operations and encryption. All modules are highly configurable and can be used with a multitude of FPGA platforms. The algorithms can be licensed per module or in packages. Simulation models for fast simulation with SystemC can be optionally licensed. These Electronic System Level models are available timed and untimed for verification in early phases of development. They are also the base for further customizing the cores. CoSynth offers the necessary high-level synthesis technology as well as contract development for customization and system design. GründerCampus Niedersachsen - This company is supported by the European Regional Development Fund. EXIST-Gründerstipendium - Supported by the German Ministry of Economics and Technology and the European Social Fund (ESF).